Zeiger became Larry King when his first boss called his name "too ethnic"
Editors' Note: Below is an excerpt from Larry King's new autobiography "My Remarkable Journey" published by Weinstein Books. Larry King anchors "Larry King Live at 9 p.m. ET on CNN. 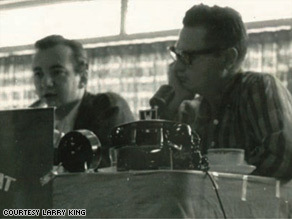 In 1959, Bobby Darin, left, was Larry's first major guest on his WKAT radio program. I went to stay with my Uncle Jack in Miami Beach. I was so excited that I started knocking on doors the next day. I stopped at a small station on First Street, WAHR. The guy in charge liked my voice. "We get a lot of people coming and going," he told me. "If you hang around, you'll get the first opening." I sat and watched in fascination for a few weeks. It was a tiny operation, but the sight of the UPI and AP machines furiously clicking out news made me feel like I was on the brink of something big. Miami Beach was like a dream. The palm trees. The ocean. I remember walking past Joe's Stone Crab. Joe's is more than a restaurant, it's a landmark. It was full when I arrived in 1957, and I guarantee you, people will be waiting in line tomorrow night. I stopped outside the front window with only a few dollars in my pocket, unable to afford a meal, looking at the happy faces, wondering what it would take to get into a place like that. Then came my big break. There was a morning deejay named Tom Baer. He was making sixty dollars a week and his alimony was sixty-five. He claimed to be living off the coconuts falling from trees. He quit on a Friday, and the general manager told me I could start on Monday. I must have rehearsed the entire weekend. I don't even think I slept. On Monday morning I showed up at WAHR with the record that would play my theme song, "Swingin' Down the Lane." The general manager called me into his office to wish me good luck. "By the way," he said, "what name are you going to use?" Celebrate Larry's remarkable journey with your questions for Larry. Send a question today and you could win a trip to meet Larry in LA. "You can't use Larry Zeiger," he said. "It's too ethnic. People won't be able to spell it or remember it. You need a better name." There was no time to think about whether this was good or bad or what my mother would say. I was going on the air in five minutes. The Miami Herald was spread out on his desk. Face-up was a full-page ad for King's Wholesale Liquors. The general manager looked down and said, "King! How about Larry King?" "OK," I said. This was the opportunity of a lifetime. I wasn't going to blow it. "Fine. You'll host The Larry King Show." Nine o'clock was approaching. That's when the news came on. A few minutes later, The Larry King Show would make its debut. I went through the control-room door, sat down, and set up my record. The news ended. I started my theme song, then faded down the music so I could introduce myself. I opened my mouth. It was as dry as cotton. For the first time in my life, I couldn't speak. So I brought "Swingin' Down the Lane" up again and faded it once more. Again, not a single word came out of my mouth. I could only wonder if listeners were hearing the pounding of my heart. I'd waited for this moment my whole life. How could I be blowing it? Once more, I cranked up "Swingin' Down the Lane" -- but not a word came out of me. The next thing I knew, the general manager was kicking open the door to the control room. "This is a communications business!" he roared in a way that only a general manager can. Then he turned, walked out, and slammed the door behind him. Shaken, I leaned in to the microphone and said, "Good morning. This is my first day ever on the radio. I've always wanted to be on the air. I've been practicing all weekend. A few minutes ago, they gave me my new name. I've had a theme song ready to play, but my mouth is dry. I'm nervous. And the general manager just kicked open the door and said, 'This is a communications business!'" That's how my career started on May 1, 1957. Years later, Arthur Godfrey would tell me, "The only secret in this business is...there is no secret." He was right. I learned a great lesson on my first day. There's no trick to being yourself. I don't think I've ever been nervous on the air since then.